New Delhi, January 8 For the first time in 20 years, Afghan refugees in India have evinced interest in returning to Afghanistan. 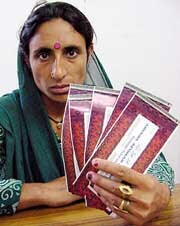 The changing political conditions in Afghanistan have encouraged 80 Hindu and Sikh Afghan refugees to opt for voluntary repatriation since April 2002. The Ariana Airlines direct flight between India and Afghanistan was resumed in March 2002. According to an UNHCR brief, 11,629 Afghan refugees are registered in India. Nearly 80 per cent of these are of Indian origin (Hindus and Sikhs). Afghan refugees first came to India in the early 80s following the erstwhile Soviet Union intervention in Afghanistan. Most of the refugees came when the Najibullah regime fell in 1992. Sources in the UNHCR told TNS that during the past three-and-a-half years, they had received maximum number of requests for repatriation in 2002.